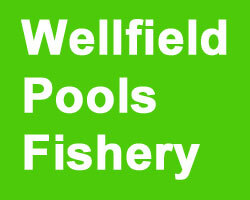 Wellfield's fishing provide a warm welcome from Steve and Norman who come to collect the day ticket money from you. We offer you a lot of good advice on how to fish the pools as there are 7 to choose from. What bait should be used and the best method to fish. Season tickets are available, we want you to feel welcome and at home, say hello to Steve or Norman whi will always stop and say hello to you.The fishing is excellent, spoilt for choice, "Old Trout Pool" (great fishing-big fish). "Swimming Pool" (Deep water-big fish). "Island Pool" (Plenty of Carp on the top in the summer.) "Meaton Pool" (Nice paced fishing) "constant". (Howard's Pool). A lot of Tench. (Jack's Pool) also fishes well. You will certainly get your money's worth when you take a trip over to Wellfield's for the day. You can also buy fresh eggs, or a sack of potatoes, they are good quality. We strive to offer a valued added day's fishing come and try us out.